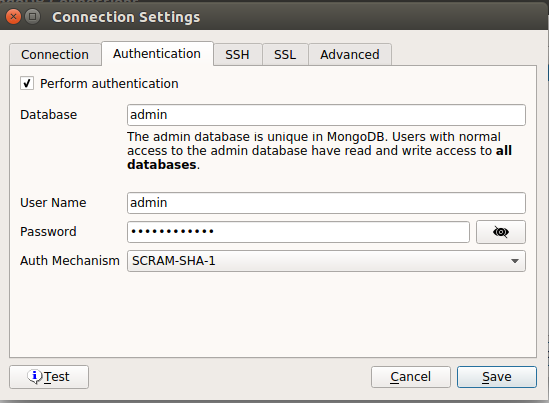 After I finished both installation and new user creation, the next thing which comes into my mind is, does MongoDB has GUI? Coming from the MSSQL background, the SQL management tool is very useful for me and for now, I think I cannot live without it when I start learning MongoDB. I am not sure if this is a correct way of thinking and using the MongoDB. 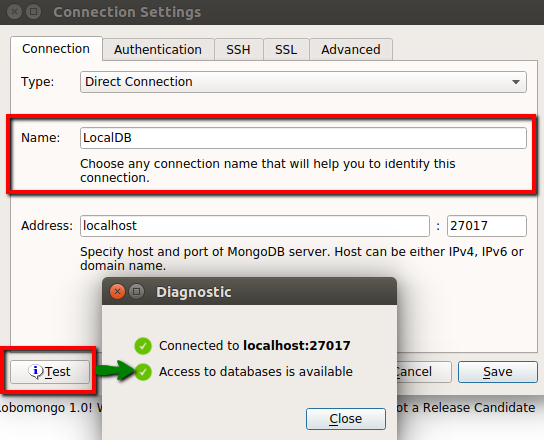 Should the MongoDB required a GUI tool to use, please advise me. I do not have any idea which GUI is good and a search from the Internet returns Robomongo as the first link in the list. So, I think I will give a try to install it in my virtual machine and test to login using the userID and password I created and start learning and using the database. The next step is create new MongoDB connection. It requires to fill up the Name of the connection and we can test the connection to port 27017 is working fine or not but clicking the ‘Test’ button. Upon receiving the success message, we can proceed to set the authentication. Test again the authentication and verified it is successful before we save the setting. I am not sure why whenever I connect to the database it does not prompt me for the userID and password. Is it meant to be this way? I will update on this part after my research. Stay tuned!